This past November while traveling to Ethiopia we had the honor of a few of our supporters traveling with us. Ali, from Ohio shares her thoughts on our day at Children’s Heaven. Thank you Ali for your dedication to EOR. 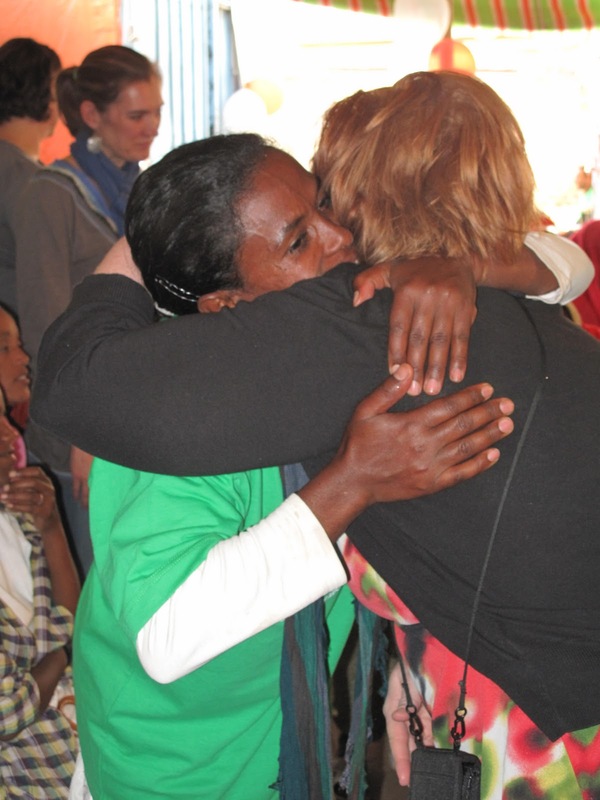 On our second day in Ethiopia we visited the girls of Children’s Heaven. They generously invited us to join them in celebrating their 7th anniversary. We drove up to balloons, music, food, dancing, and (my favorite) a mini-shop filled with items made by the girls. I picked up some amazing dresses for my little Ethiopian (sadly, for those of you who know my L, you also know the chances of me actually getting her to wear a dress is close to zero), some drums, baskets and jewelry, all proudly displayed by the girls who made them. My only regret is that luggage space limited the amount I could purchase and take home. I fought back tears (rather unsuccessfully, most times) during my visit, as I constantly saw my daughter in the girls of Children’s Heaven. The shape of a girl’s eyes, a hairstyle, a movement, a gesture would remind me of L and I would start to cry. 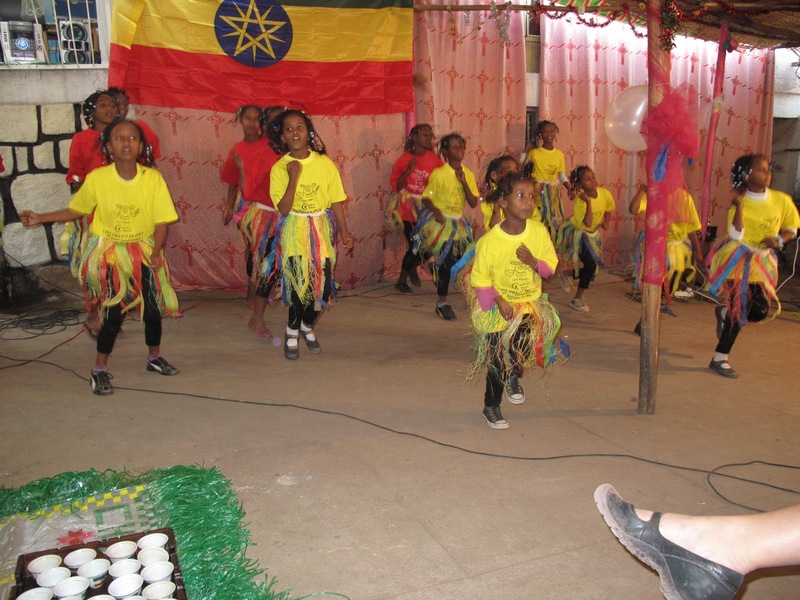 During the celebration the girls were shy but friendly, excited to show us their handmade products and dance routines. They danced along to Beyonce’s “Run the World (Girls)” and it was lovely to see them mouthing the words. I silently prayed that they believed those lyrics. That they recognized and understood their own power and courage. These girls had overcome so much and had not only survived but were seizing the opportunity to thrive. If that is not the definition of courage, I don’t know what is. What took place next was probably one of the most profound experiences of my entire trip. Three girls stood up and told their stories to the crowd. One girl spoke of losing her parents to HIV/AIDS and having to drop out of school to care for her siblings. Another spoke of having a mother too ill to work, so she was forced to sell their spoons so they could eat that week. Another girl was turned out of her home by her mother’s new husband, left to fend for herself with no income, no education, no shelter, no protection. All of these girls either faced or were confronted with the inevitability of starvation, homelessness, and vulnerability to all manner of exploitation. At one point the translator was so overcome she had to stop. The loss these girls have endured is truly beyond my comprehension. Their bravery, strength and composure in the face of such loss was absolutely staggering. I learned from the testimonials of the mothers that Hanna and Children’s Heaven cares for the girls by also caring for their families. I heard many stories of Children’s Heaven providing living essentials so the girls could remain at home, finding families housing, and providing parents with transportation so that they could continue to receive the medical treatment they so desperately needed. All three girls credited Hanna and Children’s Heaven for changing the course of their lives. They now have a safe place to go each day where they can be educated, learn crafts, exercise, and (thanks to EOR and its donors) have a healthy meal each day. With the help of Children’s Heaven families are able to stay together. 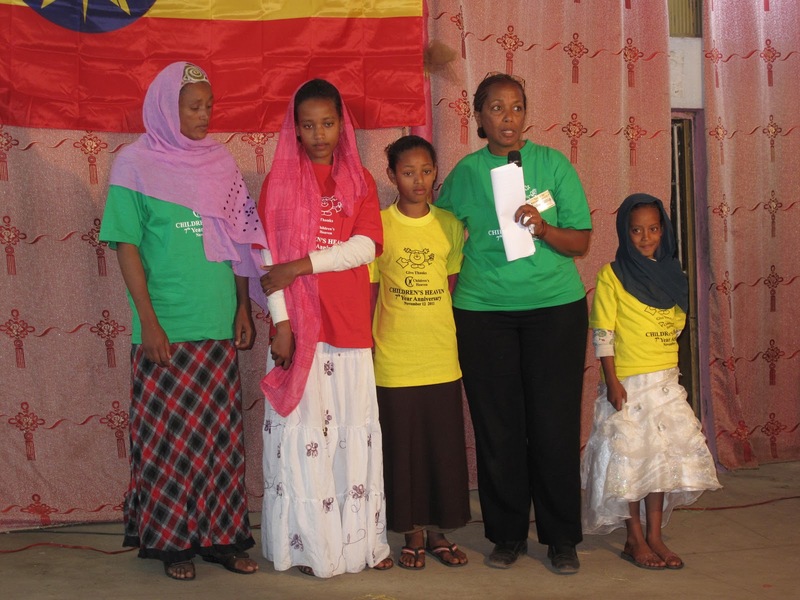 One of the many things I love about EOR is that they choose partners that focus not only on improving the lives of Ethiopia’s orphans, but also work to keep families intact and prevent these children from becoming orphans in the first place. It was a day I will never forget. I will always remember the smiles and the laughter, the tears and the grief of the girls of Children’s Heaven. I will remember their strength, courage and pride. I will remember what a difference EOR has already made to the 80 girls in the program, and what is still to be done for the 200+ girls that are currently on the waiting list. I saw my daughter in all of them, and so I can never forget. The Director of Children’s Heaven, Hanna Fanta. Hanna with a family that has benefited from the services provided by Children’s Heaven. Up for auction, we have a gorgeous painting entitled “Forms” by Denver artist Tracy Stevens. The painting is similar (but larger than) a similar painting donated by Ms. Stevens to EOR’s Art for Ethiopia event. This version is 3 foot x 4 foot in size, and oil paint on canvas. The painting, a $300 value, will be awarded to the highest bidder as of Friday, January 30, 2009 at midnight (MST). To bid, simply leave a comment with your name, your bid and the way you’d like to be contacted should you win (phone number or email address). If you’d prefer not to leave this information in a comment, please email us with your bid at info@ethiopianorphanrelief.org and we’ll post your name and the bid amount (with no contact info) so others know the current bid. Bid high, bid often and thank you! 100% of the proceeds from this auction will go to benefit Hanna Fanta, tireless founder of Children’s Heaven, because the gift certificate was an outright donation from an adoptive parent and adoption professional. Up for auction, we have 3 hours of counseling/consultation with the Red Thread Counseling Center in Centennial, CO. The counseling/consultation may be used for phone consultations from anywhere in the world, or for in person counseling/consultations in Centennial, CO. It may be used by families considering adoption (i.e., where one spouse or another family member may need to talk through their concerns or get answers to their questions), families still in the adoption process (i.e., to review a referral and put together a mental health/attachment gameplan upon homecoming), for families newly home (i.e., to work on attachment)or for families who have been home for some time, but are now noticing areas where counseling could be of benefit. The gift certificate, a $255 value, is valid until May 2009, and will be awarded to the highest bidder as of Friday, January 30, 2009 at midnight (MST). 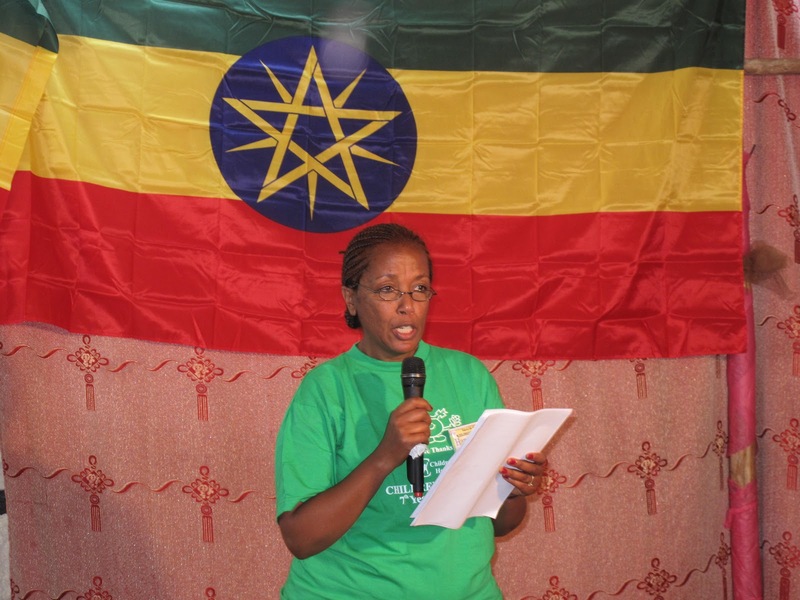 Hanna Fanta, the director of Children’s Heaven, works tirelessly to provide care, support and love to orphaned teenage girls in Addis Ababa. She receives no salary for her efforts, and 100% of the donations to Children’s Heaven otherwise go directly to the girls. It has recently come to our attention that Hanna is experiencing some health issues, and has been ignoring her own health needs in order to continue supporting the children. In an attempt to help, we have listed a beautiful hardcover book about Ethiopian adoption in our EOR Store. 100% of the profits from the sale of this book will go to providing Hanna with extra money to address her own health and sustenance needs, so that she can continue to devote her time and energy to the girls. The book is listed under the “stationary” category in the store. We’ll also be listing a couple silent auction items on Friday to benefit Hanna. Thank you for your support!! And, please, if you would, post a link to this post on your blog and tell your various adoption support group members, family and friends!